This article is about cosmologies in which Earth is or was held to be flat. For the modern misconception that medieval Europeans generally thought the Earth was flat, see Myth of the flat Earth. For other uses, see Flat Earth (disambiguation). The flat Earth model is an archaic conception of Earth's shape as a plane or disk. Many ancient cultures subscribed to a flat Earth cosmography, including Greece until the classical period, the Bronze Age and Iron Age civilizations of the Near East until the Hellenistic period, India until the Gupta period (early centuries AD), and China until the 17th century. The idea of a spherical Earth appeared in Greek philosophy with Pythagoras (6th century BC), although most pre-Socratics (6th–5th century BC) retained the flat Earth model. Aristotle provided evidence for the spherical shape of the Earth on empirical grounds by around 330 BC. Knowledge of the spherical Earth gradually began to spread beyond the Hellenistic world from then on. Despite the scientific fact of Earth's sphericity, pseudoscientific flat Earth conspiracy theories are espoused by modern flat Earth societies and, increasingly, by unaffiliated individuals using social media. 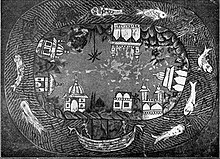 In early Egyptian and Mesopotamian thought, the world was portrayed as a disk floating in the ocean. A similar model is found in the Homeric account from the 8th century BC in which "Okeanos, the personified body of water surrounding the circular surface of the Earth, is the begetter of all life and possibly of all gods." 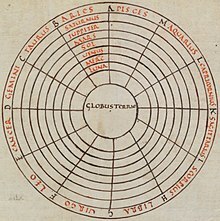 Both Homer and Hesiod described a disc cosmography on the Shield of Achilles. This poetic tradition of an Earth-encircling (gaiaokhos) sea (Oceanus) and a disc also appears in Stasinus of Cyprus, Mimnermus, Aeschylus, and Apollonius Rhodius. Homer's description of the disc cosmography on the shield of Achilles with the encircling ocean is repeated far later in Quintus Smyrnaeus' Posthomerica (4th century AD), which continues the narration of the Trojan War. Several pre-Socratic philosophers believed that the world was flat: Thales (c. 550 BC) according to several sources, and Leucippus (c. 440 BC) and Democritus (c. 460–370 BC) according to Aristotle. Thales thought the Earth floated in water like a log. It has been argued, however, that Thales actually believed in a round Earth. Anaximander (c. 550 BC) believed the Earth was a short cylinder with a flat, circular top that remained stable because it was the same distance from all things. Anaximenes of Miletus believed that "the Earth is flat and rides on air; in the same way the Sun and the Moon and the other heavenly bodies, which are all fiery, ride the air because of their flatness." Xenophanes of Colophon (c. 500 BC) thought that the Earth was flat, with its upper side touching the air, and the lower side extending without limit. Belief in a flat Earth continued into the 5th century BC. Anaxagoras (c. 450 BC) agreed that the Earth was flat, and his pupil Archelaus believed that the flat Earth was depressed in the middle like a saucer, to allow for the fact that the Sun does not rise and set at the same time for everyone. Hecataeus of Miletus believed the Earth was flat and surrounded by water. 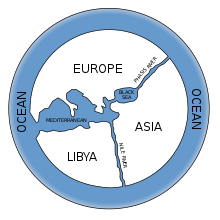 Herodotus in his Histories ridiculed the belief that water encircled the world, yet most classicists agree he still believed the Earth was flat because of his descriptions of literal "ends" or "edges" of the Earth. And Jafnhárr said: "Of the blood, which ran and welled forth freely out of his wounds, they made the sea, when they had formed and made firm the Earth together, and laid the sea in a ring round. about her; and it may well seem a hard thing to most men to cross over it." If you take a lighted candle and set it in a room, you may expect it to light up the entire interior, unless something should hinder, though the room be quite large. But if you take an apple and hang it close to the flame, so near that it is heated, the apple will darken nearly half the room or even more. However, if you hang the apple near the wall, it will not get hot; the candle will light up the whole house; and the shadow on the wall where the apple hangs will be scarcely half as large as the apple itself. From this you may infer that the Earth-circle is round like a ball and not equally near the sun at every point. But where the curved surface lies nearest the sun's path, there will the greatest heat be; and some of the lands that lie continuously under the unbroken rays cannot be inhabited. In a passage of Zhang Heng's cosmogony not translated by Needham, Zhang himself says: "Heaven takes its body from the Yang, so it is round and in motion. Earth takes its body from the Yin, so it is flat and quiescent". The point of the egg analogy is simply to stress that the Earth is completely enclosed by Heaven, rather than merely covered from above as the Kai Tian describes. Chinese astronomers, many of them brilliant men by any standards, continued to think in flat-Earth terms until the seventeenth century; this surprising fact might be the starting-point for a re-examination of the apparent facility with which the idea of a spherical Earth found acceptance in fifth-century BC Greece. Further examples cited by Needham supposed to demonstrate dissenting voices from the ancient Chinese consensus actually refer without exception to the Earth being square, not to it being flat. Accordingly, the 13th-century scholar Li Ye, who argued that the movements of the round heaven would be hindered by a square Earth, did not advocate a spherical Earth, but rather that its edge should be rounded off so as to be circular. However, Needham disagrees, affirming that Li Ye believed the Earth to be spherical, similar in shape to the heavens but much smaller. This was preconceived by the 4th-century scholar Yu Xi, who argued for the infinity of outer space surrounding the Earth and that the latter could be either square or round, in accordance to the shape of the heavens. When Chinese geographers of the 17th century, influenced by European cartography and astronomy, showed the Earth as a sphere that could be circumnavigated by sailing around the globe, they did so with formulaic terminology previously used by Zhang Heng to describe the spherical shape of the Sun and Moon (i.e. that they were as round as a crossbow bullet). As noted in the book Huainanzi, in the 2nd century BC, Chinese astronomers effectively inverted Eratosthenes' calculation of the curvature of the Earth to calculate the height of the Sun above the Earth. By assuming the Earth was flat, they arrived at a distance of 100,000 li (approximately 200,000 km). The Zhoubi Suanjing also discusses how to determine the distance of the Sun by measuring the length of noontime shadows at different latitudes, a method similar to Eratosthenes' measurement of the circumference of the Earth, but the Zhoubi Suanjing assumes that the Earth is flat. Pythagoras in the 6th century BC and Parmenides in the 5th century stated that the Earth is spherical, and this view spread rapidly in the Greek world. Around 330 BC, Aristotle maintained on the basis of physical theory and observational evidence that the Earth was spherical, and reported an estimate of its circumference. The Earth's circumference was first determined around 240 BC by Eratosthenes. By the second century AD, Ptolemy had derived his maps from a globe and developed the system of latitude, longitude, and climes. His Almagest was written in Greek and only translated into Latin in the 11th century from Arabic translations. Lucretius (1st century BC) opposed the concept of a spherical Earth, because he considered that an infinite universe had no center towards which heavy bodies would tend. Thus, he thought the idea of animals walking around topsy-turvy under the Earth was absurd. By the 1st century AD, Pliny the Elder was in a position to claim that everyone agreed on the spherical shape of Earth, though disputes continued regarding the nature of the antipodes, and how it is possible to keep the ocean in a curved shape. The Vedic texts depict the cosmos in many ways. The earliest Indian cosmological texts picture the Earth as one of a stack of flat disks. In the Vedic texts, Dyaus (heaven) and Prithvi (Earth) are compared to wheels on an axle, yielding a flat model. They are also described as bowls or leather bags, yielding a concave model. According to Macdonell: "the conception of the Earth being a disc surrounded by an ocean does not appear in the Samhitas. But it was naturally regarded as circular, being compared with a wheel (10.89) and expressly called circular (parimandala) in the Shatapatha Brahmana." By about the 5th century CE, the siddhanta astronomy texts of South Asia, particularly of Aryabhata, assume a spherical Earth as they develop mathematical methods for quantitative astronomy for calendar and time keeping. The medieval Indian texts called the Puranas describe the Earth as a flat-bottomed, circular disk with concentric oceans and continents. This general scheme is present not only in the Hindu cosmologies but also in Buddhist and Jain cosmologies of South Asia. However, some Puranas include other models. For example, the fifth canto of the Bhagavata Purana, includes sections that describe the Earth both as flat and spherical. During the early period of the Christian Church, the spherical view continued to be widely held, with some notable exceptions.Athenagoras, an eastern Christian writing around the year 175 CE said, believed the Earth was spherical. Methodius (c. 290 AD), an eastern Christian writing against "the theory of the Chaldeans and the Egyptians" said, "Let us first lay bare ... the theory of the Chaldeans and the Egyptians. They say that the circumference of the universe is likened to the turnings of a well-rounded globe, the Earth being a central point. They say that since its outline is spherical, ... the Earth should be the center of the universe, around which the heaven is whirling." Lactantius, a western Christian writer and advisor to the first Christian Roman Emperor, Constantine, and writing sometime between 304–313 CE, ridiculed the notion of antipodes and the philosophers who fancied that "the universe is round like a ball. They also thought that heaven revolves in accordance with the motion of the heavenly bodies. ... For that reason, they constructed brass globes, as though after the figure of the universe." Arnobius, another eastern Christian writing sometime around 305 CE, described the round Earth: "In the first place, indeed, the world itself is neither right nor left. It has neither upper nor lower regions, nor front nor back. For whatever is round and bounded on every side by the circumference of a solid sphere, has no beginning or end ..."
But as to the fable that there are Antipodes, that is to say, men on the opposite side of the Earth, where the sun rises when it sets to us, men who walk with their feet opposite ours that is on no ground credible. And, indeed, it is not affirmed that this has been learned by historical knowledge, but by scientific conjecture, on the ground that the Earth is suspended within the concavity of the sky, and that it has as much room on the one side of it as on the other: hence they say that the part that is beneath must also be inhabited. But they do not remark that, although it be supposed or scientifically demonstrated that the world is of a round and spherical form, yet it does not follow that the other side of the Earth is bare of water; nor even, though it be bare, does it immediately follow that it is peopled. For Scripture, which proves the truth of its historical statements by the accomplishment of its prophecies, gives no false information; and it is too absurd to say, that some men might have taken ship and traversed the whole wide ocean, and crossed from this side of the world to the other, and that thus even the inhabitants of that distant region are descended from that one first man. [Augustine] was familiar with the Greek theory of a spherical Earth, nevertheless, (following in the footsteps of his fellow North African, Lactantius), he was firmly convinced that the Earth was flat, was one of the two biggest bodies in existence and that it lay at the bottom of the universe. Apparently Augustine saw this picture as more useful for scriptural exegesis than the global Earth at the centre of an immense universe. Diodorus of Tarsus, a leading figure in the School of Antioch and mentor of John Chrysostom, may have argued for a flat Earth; however, Diodorus' opinion on the matter is known only from a later criticism. Chrysostom, one of the four Great Church Fathers of the Eastern Church and Archbishop of Constantinople, explicitly espoused the idea, based on scripture, that the Earth floats miraculously on the water beneath the firmament. Athanasius the Great, Church Father and Patriarch of Alexandria, expressed a similar view in Against the Heathen. Christian Topography (547) by the Alexandrian monk Cosmas Indicopleustes, who had travelled as far as Sri Lanka and the source of the Blue Nile, is now widely considered the most valuable geographical document of the early medieval age, although it received relatively little attention from contemporaries. In it, the author repeatedly expounds the doctrine that the universe consists of only two places, the Earth below the firmament and heaven above it. Carefully drawing on arguments from scripture, he describes the Earth as a rectangle, 400 days' journey long by 200 wide, surrounded by four oceans and enclosed by four massive walls which support the firmament. The spherical Earth theory is contemptuously dismissed as "pagan". Severian, Bishop of Gabala (d. 408), wrote that the Earth is flat and the Sun does not pass under it in the night, but "travels through the northern parts as if hidden by a wall". Basil of Caesarea (329–379) argued that the matter was theologically irrelevant. Early medieval Christian writers in the early Middle Ages felt little urge to assume flatness of the Earth, though they had fuzzy impressions of the writings of Ptolemy and Aristotle, relying more on Pliny. With the end of the Western Roman Empire, Western Europe entered the Middle Ages with great difficulties that affected the continent's intellectual production. Most scientific treatises of classical antiquity (in Greek) were unavailable, leaving only simplified summaries and compilations. In contrast, the Eastern Roman Empire did not fall, and it preserved the learning. Still, many textbooks of the Early Middle Ages supported the sphericity of the Earth in the western part of Europe. Bishop Isidore of Seville (560–636) taught in his widely read encyclopedia, the Etymologies, diverse views such as that the Earth "resembles a wheel" resembling Anaximander in language and the map that he provided. This was widely interpreted as referring to a disc-shaped Earth. 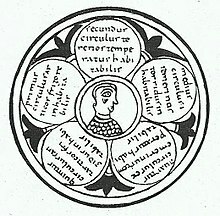 An illustration from Isidore's De Natura Rerum shows the five zones of the Earth as adjacent circles. Some have concluded that he thought the Arctic and Antarctic zones were adjacent to each other. He did not admit the possibility of antipodes, which he took to mean people dwelling on the opposite side of the Earth, considering them legendary and noting that there was no evidence for their existence. 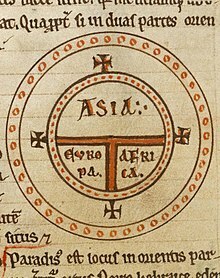 Isidore's T and O map, which was seen as representing a small part of a spherical Earth, continued to be used by authors through the Middle Ages, e.g. the 9th-century bishop Rabanus Maurus who compared the habitable part of the northern hemisphere (Aristotle's northern temperate clime) with a wheel. At the same time, Isidore's works also gave the views of sphericity, for example, in chapter 28 of De Natura Rerum, Isidore claims that the sun orbits the Earth and illuminates the other side when it is night on this side. See French translation of De Natura Rerum. In his other work Etymologies, there are also affirmations that the sphere of the sky has Earth in its center and the sky being equally distant on all sides. Other researchers have argued these points as well. "The work remained unsurpassed until the thirteenth century and was regarded as the summit of all knowledge. It became an essential part of European medieval culture. Soon after the invention of typography it appeared many times in print." However, "The Scholastics – later medieval philosophers, theologians, and scientists – were helped by the Arabic translators and commentaries, but they hardly needed to struggle against a flat-Earth legacy from the early middle ages (500–1050). Early medieval writers often had fuzzy and imprecise impressions of both Ptolemy and Aristotle and relied more on Pliny, but they felt (with one exception), little urge to assume flatness." As for the perverse and sinful doctrine which he (Virgil) against God and his own soul has uttered – if it shall be clearly established that he professes belief in another world and other men existing beneath the Earth, or in (another) sun and moon there, thou art to hold a council, deprive him of his sacerdotal rank, and expel him from the Church. Some authorities have suggested that the sphericity of the Earth was among the aspects of Vergilius's teachings that Boniface and Zachary considered objectionable. Others have considered this unlikely, and take the wording of Zachary's response to indicate at most an objection to belief in the existence of humans living in the antipodes. In any case, there is no record of any further action having been taken against Vergilius. He was later appointed bishop of Salzburg, and was canonised in the 13th century. 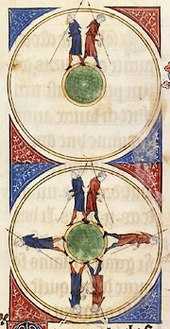 A possible non-literary but graphic indication that people in the Middle Ages believed that the Earth (or perhaps the world) was a sphere is the use of the orb (globus cruciger) in the regalia of many kingdoms and of the Holy Roman Empire. It is attested from the time of the Christian late-Roman emperor Theodosius II (423) throughout the Middle Ages; the Reichsapfel was used in 1191 at the coronation of emperor Henry VI. However the word 'orbis' means 'circle' and there is no record of a globe as a representation of the Earth since ancient times in the west until that of Martin Behaim in 1492. Additionally it could well be a representation of the entire 'world' or cosmos. A recent study of medieval concepts of the sphericity of the Earth noted that "since the eighth century, no cosmographer worthy of note has called into question the sphericity of the Earth". However, the work of these intellectuals may not have had significant influence on public opinion, and it is difficult to tell what the wider population may have thought of the shape of the Earth, if they considered the question at all. Hermannus Contractus (1013–1054) was among the earliest Christian scholars to estimate the circumference of Earth with Eratosthenes' method. St. Thomas Aquinas (1225–1274), the most widely taught theologian of the Middle Ages, believed in a spherical Earth; and he even took for granted his readers also knew the Earth is round. Lectures in the medieval universities commonly advanced evidence in favor of the idea that the Earth was a sphere. Portuguese navigation down and around the coast of Africa in the latter half of the 1400s gave wide-scale observational evidence for Earth's sphericity. In these explorations, the sun's position moved more northward the further south the explorers travel. Its position directly overhead at noon gave evidence for crossing the equator. These apparent solar motions in detail were more consistent with north-south curvature and a distant sun, than with any flat-Earth explanation. The ultimate demonstration came when Ferdinand Magellan's expedition completed the first global circumnavigation in 1521. Antonio Pigafetta, one of the few survivors of the voyage, recorded the loss of a day in the course of the voyage, giving evidence for east-west curvature. The Abbasid Caliphate saw a great flowering of astronomy and mathematics in the 9th century AD. Muslim scholars of the past believed in a spherical Earth. The Quran mentions that the Earth (al-arḍ) was "spread out". To this 12th-century commentary, the Tafsir al-Kabir (al-Razi) by Fakhr al-din al-Razi, states "If it is said: Do the words 'And the Earth We spread out' indicate that it is flat? We would respond: Yes, because the Earth, even though it is round, is an enormous sphere, and each little part of this enormous sphere, when it is looked at, appears to be flat. As that is the case, this will dispel what they mentioned of confusion. The evidence for that is the verse in which Allah says (interpretation of the meaning): 'And the mountains as pegs' [an-Naba' 78:7]. He called them awtaad (pegs) even though these mountains may have large flat surfaces. And the same is true in this case." The 11th-century scholar Ibn Hazm stated, "Evidence shows that the Earth is a sphere but public people say the opposite." He added, "None of those who deserve being Imams for Muslims has denied that Earth is round. And we have not received anything indicates a denial, not even a single word." Scholar Ibn Taymiyyah stated that the Earth is spherical and not flat. He stated that the Arabic word falak (Arabic: فَلَكٍ‎) refers to that which is round. Ibn Abbas said it is like that of a spinning wheel. The word is used in Quran 21:33 and Quran 36:40. The scholar Al-Suyuti stated that the belief in a flat Earth is a deviation. The Ming-Chinese Shanhai Yudi Quantu map in the Sancai Tuhui encyclopedia, published in 1609, with translations in English from Roderich Ptak's "The Sino-European Map". A spherical terrestrial globe was introduced to Yuan-era Khanbaliq (i.e. Beijing) in 1267 by the Persian astronomer Jamal ad-Din, but it is not known to have made an impact on the traditional Chinese conception of the shape of the Earth. As late as 1595, an early Jesuit missionary to China, Matteo Ricci, recorded that the Ming-dynasty Chinese say: "The Earth is flat and square, and the sky is a round canopy; they did not succeed in conceiving the possibility of the antipodes." The universal belief in a flat Earth is confirmed by a contemporary Chinese encyclopedia from 1609 illustrating a flat Earth extending over the horizontal diametral plane of a spherical heaven. In the 17th century, the idea of a spherical Earth spread in China due to the influence of the Jesuits, who held high positions as astronomers at the imperial court. Matteo Ricci, in collaboration with Chinese cartographers and translator Li Zhizao, published the Kunyu Wanguo Quantu in 1602, the first Chinese world map based on European discoveries. The astronomical and geographical treatise Gezhicao (格致草) written in 1648 by Xiong Mingyu (熊明遇) explained that the Earth was spherical, not flat or square, and could be circumnavigated. 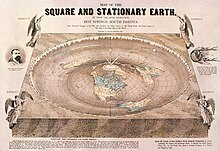 Beginning in the 19th century, a historical myth arose which held that the predominant cosmological doctrine during the Middle Ages was that the Earth was flat. An early proponent of this myth was the American writer Washington Irving, who maintained that Christopher Columbus had to overcome the opposition of churchmen to gain sponsorship for his voyage of exploration. Later significant advocates of this view were John William Draper and Andrew Dickson White, who used it as a major element in their advocacy of the thesis that there was a long lasting and essential conflict between science and religion. 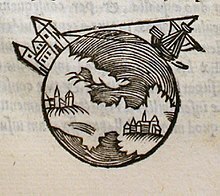 Subsequent studies of medieval science have shown that most scholars in the Middle Ages, including those read by Christopher Columbus, maintained that the Earth was spherical. Some studies of the historical connections between science and religion have demonstrated that theories of their mutual antagonism ignore examples of their mutual support. English writer Samuel Rowbotham (1816–1885), writing under the pseudonym "Parallax", produced a pamphlet, "Zetetic Astronomy", in 1849 arguing for a flat Earth and published results of many experiments that tested the curvatures of water over a long drainage ditch, followed by another called The inconsistency of Modern Astronomy and its Opposition to the Scripture. One of his supporters, John Hampden, lost a bet to Alfred Russel Wallace in the famous Bedford Level Experiment, which attempted to prove it. In 1877 Hampden produced a book, A New Manual of Biblical Cosmography. Rowbotham also produced studies that purported to show that the effects of ships disappearing below the horizon could be explained by the laws of perspective in relation to the human eye. In 1883 he founded Zetetic Societies in England and New York, to which he shipped a thousand copies of Zetetic Astronomy. William Carpenter, a printer originally from Greenwich, England (home of the Royal Observatory and central to the study of astronomy), was a supporter of Rowbotham. Carpenter published Theoretical Astronomy Examined and Exposed – Proving the Earth not a Globe in eight parts from 1864 under the name Common Sense. He later emigrated to Baltimore, where he published One Hundred Proofs the Earth is Not a Globe in 1885. He wrote, "There are rivers that flow for hundreds of miles towards the level of the sea without falling more than a few feet – notably, the Nile, which, in a thousand miles, falls but a foot. A level expanse of this extent is quite incompatible with the idea of the Earth's convexity. It is, therefore, a reasonable proof that Earth is not a globe", as well as "If the Earth were a globe, a small model globe would be the very best – because the truest – thing for the navigator to take to sea with him. But such a thing as that is not known: with such a toy as a guide, the mariner would wreck his ship, of a certainty!, This is a proof that Earth is not a globe." John Jasper, an American slave turned prolific preacher, and friend of Carpenter's, echoed his friend's sentiments in his most famous sermon "The Sun do move", preached over 250 times, always by invitation. In a written account of his sermon, published in The Richmond Whig of March 19, 1878, Jasper says he would frequently cite the verse "I saw four angels standing on the four corners of the earth," and follow up by arguing "So we are living on a four-cornered earth; then, my friends, will you tell me how in the name of God can an earth with four corners be round!" In the same article he argued " … if the earth is like others say, who hold a different theory, peopled on the other side, those people would be obliged to walk on the ground with their feet upward like flies on the ceiling of a room." In Brockport, New York, in 1887, M.C. Flanders argued the case of a flat Earth for three nights against two scientific gentlemen defending sphericity. Five townsmen chosen as judges voted unanimously for a flat Earth at the end. The case was reported in the Brockport Democrat. Professor Joseph W. Holden of Maine, a former justice of the peace, gave numerous lectures in New England and lectured on flat Earth theory at the Columbian Exposition in Chicago. His fame stretched to North Carolina where the Statesville Semi-weekly Landmark recorded at his death in 1900: "We hold to the doctrine that the Earth is flat ourselves and we regret exceedingly to learn that one of our members is dead." After Rowbotham's death, Lady Elizabeth Blount (Elizabeth de Sodington Blount, née Elizabeth Anne Mould Williams) created the Universal Zetetic Society in 1893 in England and created a journal called Earth not a Globe Review, which sold for twopence, as well as one called Earth, which only lasted from 1901 to 1904. She held that the Bible was the unquestionable authority on the natural world and argued that one could not be a Christian and believe the Earth is a globe. Well-known members included E. W. Bullinger of the Trinitarian Bible Society, Edward Haughton, senior moderator in natural science in Trinity College, Dublin and an archbishop. She repeated Rowbotham's experiments, generating some interesting counter-experiments, but interest declined after the First World War. The movement gave rise to several books that argued for a flat, stationary Earth, including Terra Firma by David Wardlaw Scott. In 1898, during his solo circumnavigation of the world, Joshua Slocum encountered a group of flat-Earthers in Durban, South Africa. Three Boers, one of them a clergyman, presented Slocum with a pamphlet in which they set out to prove that the world was flat. Paul Kruger, President of the Transvaal Republic, advanced the same view: "You don't mean round the world, it is impossible! You mean in the world. Impossible!" Wilbur Glenn Voliva, who in 1906 took over the Christian Catholic Church, a Pentecostal sect that established a utopian community in Zion, Illinois, preached flat Earth doctrine from 1915 onwards and used a photograph of a twelve-mile stretch of the shoreline at Lake Winnebago, Wisconsin taken three feet above the waterline to prove his point. When the airship Italia disappeared on an expedition to the North Pole in 1928 he warned the world's press that it had sailed over the edge of the world. He offered a $5,000 award for proving the Earth is not flat, under his own conditions. Teaching a globular Earth was banned in the Zion schools and the message was transmitted on his WCBD radio station. In 2018, astronomer Yaël Nazé analyzed the controversy over a Ph.D. thesis proposed by a student at the University of Sfax, which defended a flat Earth as well as a geocentric model of the solar system and a young Earth. The dissertation, which had not been approved by the committee overseeing environmental studies theses, had been made public and denounced in 2017 by professor Hafedh Ateb, a founder of the Tunisian Astronomical Society on his Facebook page. Azimuthal equidistant projections of the sphere like this one have also been co-opted as images of the flat Earth model depicting Antarctica as an ice wall surrounding a disk-shaped Earth. In 1956, Samuel Shenton set up the International Flat Earth Research Society (IFERS), better known as the Flat Earth Society from Dover, UK, as a direct descendant of the Universal Zetetic Society. This was just before the Soviet Union launched the first artificial satellite, Sputnik; he responded, "Would sailing round the Isle of Wight prove that it were spherical? It is just the same for those satellites." His primary aim was to reach children before they were convinced about a spherical Earth. Despite plenty of publicity, the space race eroded Shenton's support in Britain until 1967 when he started to become famous due to the Apollo program. In 1972 Shenton's role was taken over by Charles K. Johnson, a correspondent from California, US. He incorporated the IFERS and steadily built up the membership to about 3,000. He spent years examining the studies of flat and round Earth theories and proposed evidence of a conspiracy against flat Earth: "The idea of a spinning globe is only a conspiracy of error that Moses, Columbus, and FDR all fought..." His article was published in the magazine Science Digest, 1980. It goes on to state, "If it is a sphere, the surface of a large body of water must be curved. The Johnsons have checked the surfaces of Lake Tahoe and the Salton Sea without detecting any curvature." The Society declined in the 1990s following a fire at its headquarters in California and the death of Johnson in 2001. It was revived as a website in 2004 by Daniel Shenton (no relation to Samuel Shenton). He believes that no one has provided proof that the world is not flat. In the Internet era, the proliferation of communications technology and social media platforms such as YouTube, Facebook and Twitter have given individuals, famous or otherwise, a platform to spread pseudo-scientific ideas and build stronger followings. The flat-Earth conjecture has flourished in this environment. Social media and the internet, furthermore, have made it easier for like-minded theorists to connect with one another and mutually reinforce their beliefs. In other words, social media has had a "levelling effect", in that experts have less sway in the public mind than they used to. Members of the Flat Earth Society and other flat-Earthers claim that NASA and other government agencies conspire to delude the public into believing the Earth is spherical. According to the most widely spread version of current flat earth theory, NASA is guarding the Antarctic ice wall that surrounds Earth. Flat earthers argue that NASA photoshops its satellite images, based on observations that the color of the oceans changes from image to image and that continents seem to be in different places. The publicly perpetuated image is kept up through a large-scale practice of "compartmentalization", according to which only a select number of individuals have knowledge about the truth. The term flat-Earther is often used in a derogatory sense to mean anyone who holds ridiculously antiquated views. The first use of the term flat-Earther recorded by the Oxford English Dictionary is in 1934 in Punch: "Without being a bigoted flat-earther, [Mercator] perceived the nuisance ... of fiddling about with globes ... in order to discover the South Seas." The term flat-earth-man was recorded in 1908: "Fewer votes than one would have thought possible for any human candidate, were he even a flat-earth-man." ^ MacDougall, Robert. "Strange enthusiasms: a brief history of American pseudoscience". Columbia University. Retrieved July 5, 2016. ^ a b Ambrose, Graham (7 July 2017). "These Coloradans say Earth is flat. And gravity's a hoax. Now, they're being persecuted". The Denver Post. Retrieved 19 August 2017. ^ a b Dure, Beau (20 January 2016). "Flat-Earthers are back: 'It's almost like the beginning of a new religion'". The Guardian. Retrieved 19 August 2017. ^ Gottlieb, Anthony (2000). The Dream of Reason. Penguin. p. 6. ISBN 978-0-393-04951-0. ^ Ancient Near Eastern Texts, Pritchard, 1969, p. 374. ^ Berlin, Adele (2011). "Cosmology and creation". In Berlin, Adele; Grossman, Maxine (eds.). The Oxford Dictionary of the Jewish Religion. Oxford University Press. ISBN 9780199730049. ^ Hasel, Gerhard F. (1974). "The Polemic Nature of Genesis Cosmology" (PDF). The Evangelical Quarterly. 46 (2): 81–102. Retrieved 2019-03-21. ^ Johnston, Gordon H. (2008). "Genesis 1 and Ancient Egyptian Creation Myths" (PDF). Bibliotheca Sacra. 165: 178–194. Retrieved 2019-03-21. ^ Younker, Randall W.; Davidson, Richard M. (2011). "The Myth of the Solid Heavenly Dome: Another Look at the Hebrew (RĀQÎA')". Andrews University Seminary Studies. 49 (1): 125–147. Retrieved 2019-03-17. ^ Hasel, Gerhard F.; Hasel, Michael G. (2015). "The Unique Cosmology of Genesis 1 against Ancient Near Eastern and Egyptian Parallels". In Klingbeil, Gerald. A. (ed.). The Genesis Creation Account and its Reverberations in the Old Testament. Andrews University Press. ISBN 9781940980096. ^ The Shield of Heracles, 314–16, transl. Hugh G. Evelyn-White, 1914. ^ The shield of Achilles and the poetics of ekphrasis, Andrew Sprague Becker, Rowman & Littlefield, 1995, p. 148. ^ Stasinus of Cyprus wrote in his Cypria (lost, only preserved in fragment) that Oceanus surrounded the entire Earth: deep eddying Oceanus and that the Earth was flat with furthest bounds, these quotes are found preserved in Athenaeus, Deipnosophistae, VIII. 334B. ^ Posthomerica (V. 14). "Here [on the shield of Achilles] Tethys' all-embracing arms were wrought, and Okeanos fathomless flow. The outrushing flood of Rivers crying to the echoing hills all round, to right, to left, rolled o'er the land." Translation by Way, A.S. 1913. ^ Sambursky, Samuel (August 1987). The Physical World of the Greeks. Princeton University Press. p. 12. ISBN 9780691024110. ^ Burch, George Bosworth (1954). "The Counter-Earth". Osiris. Saint Catherines Press. 11 (1): 267–94. doi:10.1086/368583. ^ De Fontaine, Didier (2002). "Flat worlds: Today and in antiquity". Memorie della Società Astronomica Italiana, Special Issue. 1 (3): 257–62. Bibcode:2002MmSAI..73S.257D. Retrieved August 3, 2007. ^ O'Grady, Patricia F. (2002). Thales of Miletus: the beginnings of Western science and philosophy. Aldershot: Ashgate. pp. 87–107. ISBN 9780754605331. ^ Pseudo-Plutarch. Placita Philosophorum. Perseus Digital Library. V.3, Ch.10. Retrieved December 24, 2014. ^ Anaximander; Fairbanks (editor and translator), Arthur. "Fragments and Commentary". The Hanover Historical Texts Project. (Plut., Strom. 2 ; Dox. 579). ^ The Sacred Tree in Religion and Myth, Mrs. J. H. Philpot, Courier Dover Publications, 2004, p. 113. ^ "The world was a flat disk, with the Earth in the center and the sea all around. Thus the serpent is about as far away from the center, where men and gods lived" (Norse mythology: a guide to the Gods, heroes, rituals, and beliefs, John Lindow Oxford University Press, 2002) p. 253. ^ "Gylfaginning". Sacred-texts.com. Retrieved February 9, 2013. ^ "The King's Mirror". mediumaevum.com. Retrieved November 6, 2013. ^ Martzloff, Jean-Claude (1993–94). "Space and Time in Chinese Texts of Astronomy and of Mathematical Astronomy in the Seventeenth and Eighteenth Centuries". Chinese Science (11): 66–92 [p. 69]. JSTOR 43290474. ^ Cullen, Christopher (1980). "Joseph Needham on Chinese Astronomy". Past & Present. 87 (1): 39–53 [pp. 42, 49]. doi:10.1093/past/87.1.39. JSTOR 650565. ^ Cullen, Christopher (1976). "A Chinese Eratosthenes of the Flat Earth: A Study of a Fragment of Cosmology in Huai Nan tzu 淮 南 子". Bulletin of the School of Oriental and African Studies. 39 (1): 106–27 [pp. 107–09]. doi:10.1017/S0041977X00052137. ^ Cullen, Christopher (1976). "A Chinese Eratosthenes of the Flat Earth: A Study of a Fragment of Cosmology in Huai Nan tzu 淮 南 子". Bulletin of the School of Oriental and African Studies. 39 (1): 106–27 [p. 107]. doi:10.1017/S0041977X00052137. ^ Needham, Joseph (1959). Science and Civilisation in China. 3. Cambridge University Press. p. 219. ISBN 978-0-521-05801-8. ^ Cullen, Christopher (1980). "Joseph Needham on Chinese Astronomy". Past & Present. 87 (87): 39–53 [p. 42]. doi:10.1093/past/87.1.39. JSTOR 650565. ^ Cullen, Christopher (1976). "A Chinese Eratosthenes of the Flat Earth: A Study of a Fragment of Cosmology in Huai Nan tzu 淮 南 子". Bulletin of the School of Oriental and African Studies. 39 (1): 106–27 [p. 108]. doi:10.1017/S0041977X00052137. ^ a b c Cullen, Christopher (1976). "A Chinese Eratosthenes of the Flat Earth: A Study of a Fragment of Cosmology in Huai Nan tzu 淮 南 子". Bulletin of the School of Oriental and African Studies. 39 (1): 106–27 [p. 109]. doi:10.1017/S0041977X00052137. ^ Needham, Joseph; Wang, Ling. (1995) . Science and Civilization in China: Mathematics and the Sciences of the Heavens and the Earth, vol. 3, reprint edition. Cambridge: Cambridge University Press. ISBN 0-521-05801-5, p. 498. ^ Needham, Joseph; Wang, Ling. (1995) . Science and Civilization in China: Mathematics and the Sciences of the Heavens and the Earth, vol. 3, reprint edition. Cambridge: Cambridge University Press. ISBN 0-521-05801-5, pp. 220, 498. ^ Lloyd, G.E.R. (1996). Adversaries and Authorities: Investigations into ancient Greek and Chinese science. Cambridge: Cambridge University Press. pp. 59–60. ISBN 978-0-521-55695-8. ^ Dreyer, John Louis Emil (1953) . A History of Astronomy from Thales to Kepler. New York, NY: Dover Publications. pp. 20, 37–38. ISBN 978-0-486-60079-6. ^ On the Heavens, Book ii Chapter 14. Lloyd, G.E.R. (1968). Aristotle: The Growth and Structure of His Thought. Cambridge Univ. Press. pp. 162–64. ISBN 978-0-521-07049-2. ^ Sedley, David N. (2003). Lucretius and the Transformation of Greek Wisdom. Cambridge: Cambridge University Press. pp. 78–82. ISBN 978-0-521-54214-2. ^ Lucretius, De rerum natura, 1.1052–82. ^ Sarma, K.V. (2013). Selin, Helaine (ed.). Encyclopaedia of the History of Science, Technology, and Medicine in Non-Westen Cultures. Springer Science & Business Media. pp. 114–15. ISBN 978-94-017-1416-7. ^ Plofker 2009, p. 52. ^ a b c Gombrich, R.F. (1975). Blacker, Carmen; Loewe, Michael (eds.). Ancient Cosmologies (PDF). George Allen & Unwin. pp. 110–39. ISBN 9780041000382. Archived (PDF) from the original on 21 October 2017. ^ AA Macdonell (1986). Vedic Mythology. Motilal Banarsidass. p. 9. ISBN 978-81-208-1113-3. ^ D. Pingree: "History of Mathematical Astronomy in India", Dictionary of Scientific Biography, Vol. 15 (1978), pp. 533–633 (554ff. ), Quote: "In the Purānas, the Earth is a flat-bottomed, circular disk, in the center of which is a lofty mountain, Meru. Surrounding Meru is the circular continent Jambūdvīpa, which is in turn surrounded by a ring of water known as the Salt Ocean. There follow alternating rings of land and sea until there are seven continents and seven oceans. In the southern quarter of Jambūdvīpa lies India–Bhāratavarsa. ^ Edelmann, Jonathan (2013). Gupta, Ravi M.; Valpey, Kenneth R. (eds.). The Bhagavata Purana: Sacred Text and Living Tradition. Columbia University Press. pp. 58–59. ISBN 978-0-231-53147-4. ^ Dimmitt, Cornelia; van Buitenen, J. A. B. (2012). Classical Hindu Mythology: A Reader in the Sanskrit Puranas. Temple University Press (1st Edition: 1977). pp. 4–5, 17–25, 46–47. ISBN 978-1-4399-0464-0. ^ Cormack, Lesley (2009). "Myth 3: That Medieval Christians Taught that he Earth was Flat". In Ronald Numbers (ed.). Galileo Goes to Jail and Other Myths About Science and Religion. Harvard University Press. pp. 30–31. ISBN 9780674057418. ^ a b c d Bercot, David (1998). A Dictionary of Early Christian Beliefs. Massachusetts: Hendrickson Publishers. p. 222. ISBN 978-1565633575. The world, being made spherical, is confined within the circles of heaven. ^ Lactantius, The Divine Institutes, Book III, Chapter XXIV, The Ante-Nicene Fathers, Vol VII, ed. Rev. Alexander Roberts, D.D., and James Donaldson, LL.D., American reprint of the Edinburgh edition (1979), William B. Eerdmans Publishing Co., Grand Rapids, MI, pp. 94–95. ^ Nothaft, C.P.E. (2011). "Augustine and the Shape of the Earth: A Critique of Leo Ferrari". Augustinian Studies. 42 (1): 33–48. doi:10.5840/augstudies20114213. ^ Lindberg, David C. (1986). "Science and the Early Church". In Lindberg, David C.; Numbers, Ronald L. (eds.). God & Nature: Historical Essays on the Encounter between Christianity and Science. Berkeley and Los Angeles: University of California Press. ISBN 978-0-520-05692-3. ^ St. John Chrysostom, Homilies Concerning the Statues, Homily IX, paras. 7–8, in A Select Library of the Nicene and Post-Nicene Fathers of the Christian Church, Series I, Vol IX, ed. Philip Schaff, D.D., LL.D., American reprint of the Edinburgh edition (1978), W. B. Eerdmans Publishing Co.,Grand Rapids, MI, pp. 403–04. "When therefore thou beholdest not a small pebble, but the whole Earth borne upon the waters, and not submerged, admire the power of Him who wrought these marvellous things in a supernatural manner! And whence does this appear, that the Earth is borne upon the waters? The prophet declares this when he says, 'He hath founded it upon the seas, and prepared it upon the floods. '1416 And again: 'To him who hath founded the Earth upon the waters. '1417 What sayest thou? The water is not able to support a small pebble on its surface, and yet bears up the Earth, great as it is; and mountains, and hills, and cities, and plants, and men, and brutes; and it is not submerged!" ^ St. Athanasius, Against the Heathen, Ch.27 , Ch 36 , in A Select Library of the Nicene and Post-Nicene Fathers of the Christian Church, Series II, Vol IV, ed. Philip Schaff, D.D., LL.D., American reprint of the Edinburgh edition (1978), W.B. Eerdmans Publishing Co.,Grand Rapids, MI. 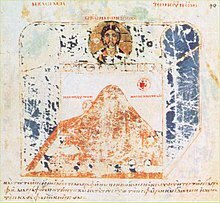 ^ "Cosmas Indicopleustes, Christian Topography. Preface to the onlineedition". ^ "Cosmas Indicopleustes, Christian Topography (1897) Introduction". ^ White, Andrew Dickson (1896). "Ch. 2, part 1". History of the Warfare of Science with Theology in Christendom. Retrieved 25 August 2015. ^ J.L.E. Dreyer (1906), A History of Planetary Systems, (1906), pp. 211–212. ^ "Saint Basil the Great, Hexaemeron 9 – Homily IX – "The creation of terrestrial animals" Holy Innocents Orthodox Church". Retrieved 9 February 2013. ^ a b c Russell, Jefrey Burton (1991). Inventing the Flat Earth: Columbus and Modern Historians. Praeger. pp. 86–87. ISBN 978-0-275-95904-3. ^ B. Eastwood and G. Graßhoff, Planetary Diagrams for Roman Astronomy in Medieval Europe, ca. 800–1500, Transactions of the American Philosophical Society, 94, 3 (Philadelphia, 2004), pp. 49–50. ^ " In other passages of the Etymologies, he writes of anorbis" W.G.Randles (2000). Geography, Cartography and Nautical Science in the Renaissance. UK, Ashgate Variorum. p. 15. ISBN 978-0-86078-836-2. also in Wolfgang Haase; Meyer Reinhold, eds. (1994). The Classical tradition and the Americas, vol 1. p. 15. ISBN 978-3-11-011572-7. Retrieved November 28, 2010. ^ Lyons, Jonathan (2009). The House of Wisdom. Bloomsbury. pp. 34–35. ISBN 978-1-58574-036-9. ^ Ernest Brehaut (1912). An Encyclopedist of the Dark Ages. Columbia University. ^ Grant, Edward (1974). A Sourcebook in Medieval Science (Source Books in the History of the Sciences). Harvard University Press. ISBN 978-0-674-82360-0. ^ Thomas Glick; Stephen John Livesley; Faith Wallis (2005). Medieval Science Technology and Medicine, an Encyclopedia. NY: Taylor & Francis. ^ Carey, John (1989). "Ireland and the Antipodes: The Heterodoxy of Virgil of Salzburg". Speculum. 64 (1): 1–10. doi:10.2307/2852184. JSTOR 2852184. ^ Kaiser, Christopher B. (1997). Creational Theology and the History of Physical Science: the Creationist Tradition from Basil to Bohr. Leiden: Koninklijke Brill. p. 48. ISBN 978-90-04-10669-7. ^ Hasse, Wolfgang; Reinhold, Meyer, eds. (1993). The Classical Tradition and the Americas. Berlin: Walter de Gruyter. ISBN 978-3-11-011572-7. ^ Moretti, Gabriella (1993). The Other World and the 'Antipodes'. The Myth of Unknown Countries between Antiquity and the Renaissance. p. 265. ISBN 978-3-11-011572-7. In Hasse & Reinhold (1993, pp. 241–84). ^ * Wright, Charles Darwin (1993). The Irish Tradition in Old English Literature. Cambridge, UK: Cambridge University Press. p. 41. ISBN 978-0-521-41909-3. ^ "Catholic Encyclopedia: St. Vergilius of Salzburg". Newadvent.org. October 1, 1912. Retrieved February 9, 2013. ^ Vogel, Klaus Anselm (1995). Sphaera terrae – das mittelalterliche Bild der Erde und die kosmographische Revolution. PhD dissertation Georg-August-Universität Göttingen. p. 19. ^ Jill Tattersall (1981). "The Earth, Sphere or Disc?". Modern Language Review. 76 (1): 31–46. doi:10.2307/3727009. JSTOR 3727009. ^ Ash-Shareef, Abdurrahim Khairullah Omar (15 November 2014). "Aspects of Ancient Muslim Scholars' Induction Drawn from the Holy Qur'an in Proving Earth is Spherical". Journal of Education and Practice. 5: 210–218. ^ For example, see verses [Quran 15:19], [Quran 20:53], [Quran 50:7], and [Quran 51:48]. ^ Ash-Shareef, Abdurrahim Khairullah Omar (2014). "Aspects of Ancient Muslim Scholars' Induction Drawn from the Holy Qur'an in Proving Earth is Spherical". Zarqa University: 217. ^ a b "Early Muslim Consensus". www.iupui.edu. Retrieved 2018-09-13. ^ Ptak, Roderich. "The Sino-European Map (Shanhai yudi quantu) in the Encyclopedia Sancai Tuhui". Accessed 19 February 2018. ^ a b Needham, Joseph (1986). Science and Civilization in China: Volume 3. Taipei: Caves Books, Ltd. pp. 499. ^ Baran, Madeleine (December 16, 2009). "Historic map coming to Minnesota". St. Paul, Minn.: Minnesota Public Radio. Retrieved 19 February 2018. ^ Fiske, John (1892). The Discovery of America. The Riverside Press. p. 267. ^ Parallax (Samuel Birley Rowbotham) (1881). Zetetic Astronomy: Earth Not a Globe (Third ed.). London: Simpkin, Marshall, and Co.
^ Theoretical astronomy examined and exposed, by 'Common sense'. 1864. ^ Carpenter, William (1885). One Hundred Proofs that the Earth is Not a Globe. Baltimore: William Carpenter – via Project Gutenberg. ^ Hatcher (1908, p.20), Garwood (2007, p.165), Randolph (1884, pp.47–53). ^ The Earth: Scripturally, Rationally, and Practically Described. A Geographical, Philosophical, and Educational Review, Nautical Guide, and General Student's Manual, n. 17 (November 1, 1887), p. 7. cited in Schadewald, Robert J. (1981). "Scientific Creationism, Geocentricity, and the Flat Earth". Skeptical Inquirer. Lock Haven University. Retrieved August 21, 2010 – via lhup.edu. ^ Wardlaw Scott, David (1901). Terra Firma. Retrieved December 13, 2010. ^ Slocum, Joshua (1900). "17–18". Sailing Alone Around the World. New York: The Century Company. ^ "$5,000 for Proving the Earth is a Globe | Modern Mechanix". blog.modernmechanix.com. May 19, 2006. Retrieved February 9, 2013. ^ Nazé, Yaël (2018). "A Doctoral Dissertation on a Geocentric Flat Earth: 'Zetetic' Astronomy at the University Level". Skeptical Inquirer. 42 (3): 12–14. ^ Robert J. Schadewald. "The Flat-out Truth". Lhup.edu. Retrieved January 22, 2018. ^ Donald E. Simanek. "The Flat Earth". Lhup.edu. Retrieved February 9, 2013. ^ "Ingenious 'Flat Earth' Theory Revealed In Old Map". LiveScience. Retrieved February 9, 2013. ^ Abbott, Erica. "Mark Zuckerberg Banning All Flat Earth Groups from Facebook Is A Hoax". Business2community.com. Business2community. Retrieved 19 August 2017. ^ Heigl, Alex (February 20, 2017). "The Short List of Famous People Who Think the Earth Is Flat (Yes, Really)". People. ^ Herreria, Carla (2017-04-22). "Neil deGrasse Tyson Cites Celebrity Flat-Earthers To Make A Point About Politics". Huffington Post. Retrieved 19 August 2017. ^ "The rise of the Flat Earthers". Science Focus - BBC Focus Magazine. Retrieved 2019-01-17. ^ a b Wolchover, Natalie; May 30, Live Science Staff |; ET, 2017 10:24am. "Are Flat-Earthers Being Serious?". Live Science. Retrieved 2019-01-17. ^ Moshakis, Alex (2018-05-27). "Is the Earth flat? Meet the people questioning science". The Observer. ISSN 0029-7712. Retrieved 2019-01-17. ^ Burdick, Alan (2018-05-30). "Looking for Life on a Flat Earth". ISSN 0028-792X. Retrieved 2019-01-17. ^ "Flat-Earth". Oxford English Dictionary. Retrieved July 29, 2013. ^ Shaw, George B. (1908). Fabian Essays on Socialism (new ed.). Ball. p. xviii. Simek, Rudolf (1996) . 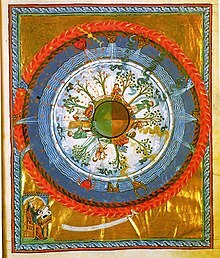 Heaven and Earth in the Middle Ages: The Physical World Before Columbus. Angela Hall (trans.). The Boydell Press. ISBN 9780851156088. Retrieved February 9, 2013. Plofker, Kim (2009). Mathematics in India. Princeton University Press. ISBN 978-0691120676. Randolph, Edwin Archer (1884), The Life of Rev. John Jasper, Pastor of Sixth Mt. Zion Baptist Church, Richmond, Va., from His Birth to the Present Time, with His Theory on the Rotation of the Sun, Richmond, VA: R.T. Hill & Co.
Wikimedia Commons has media related to Flat-earth models. Robbins, Stuart (2012-05-01). "Episode 33: Flat Earth". Exposing PseudoAstronomy Podcast. Robbins, Stuart (2016-09-05). "Episode 145: Modern Flat Earth Theory, Part 1". Exposing PseudoAstronomy Podcast. Robbins, Stuart (2016-10-04). "Episode 149: Modern Flat Earth Thought, Part 2". Exposing PseudoAstronomy Podcast. Power, Myles; James, James (2016-10-31). "Episode 146: The Lies of the Sun". League of Nerds (YouTube). – Review of a pro-Flat Earth documentary.